Running is a great lifelong sport that requires very minimal equipment and can be done just about anywhere. Unfortunately, it’s also a sport with a very high injury rate. Research studies have shown that approximately 56% of recreation runners sustain an injury each year with that number being even higher, up to 90%, in those training for a marathon. Because of the popularity of this sport and the high incidence of injury, a lot of research has been done on this topic but few conclusive answers have been found. 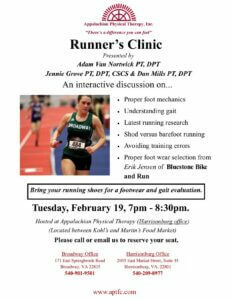 To help clear up some of the mystery surrounding probable causes of injuries and strategies to prevent them, Appalachian Physical Therapy is teaming up with Bluestone Bike and Run to offer a runner’s clinic on February 19th, 2019 from 7:00 – 8:30 PM. The goal of this clinic is to provide you with valuable information that can be immediately applied to your training to help prevent and rehabilitate existing injuries. We will also discuss proper foot wear selection and help you understand when it is important to seek help from a physical therapist. We look forward to seeing you there and if you would like more information about the seminar please click this link: RUNNER’S CLINIC 01 – 2019 to see our flyer. For other questions or to reserve your spot please contact our Harrisonburg office at (540)209-8977.